Watch Out – – – SHARKS!!! Recently, my kids have been very interested in learning about the megalodon as well as other large sharks and fish. They enjoy watching the Real or Fake videos on BillsChannel, including this one with some interesting footage from underwater cameras. 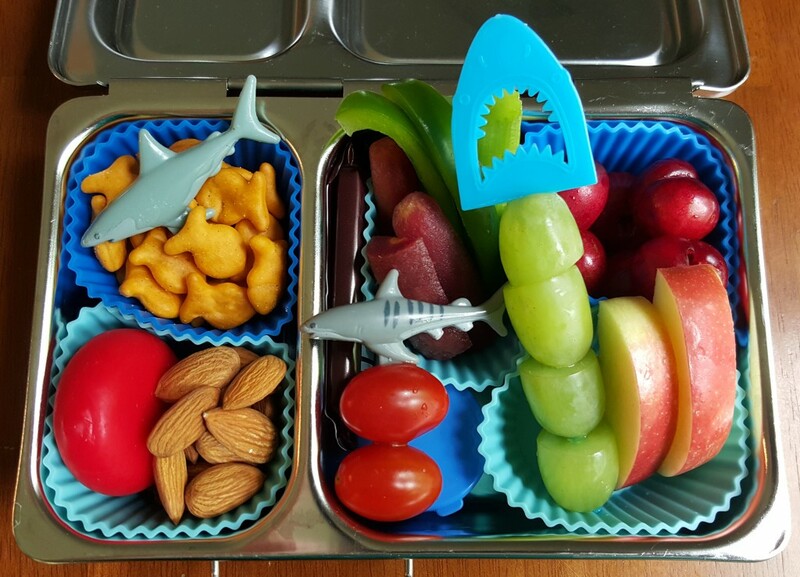 Since sharks have been on their minds, we read some shark books last evening and I packed shark-themed lunches. 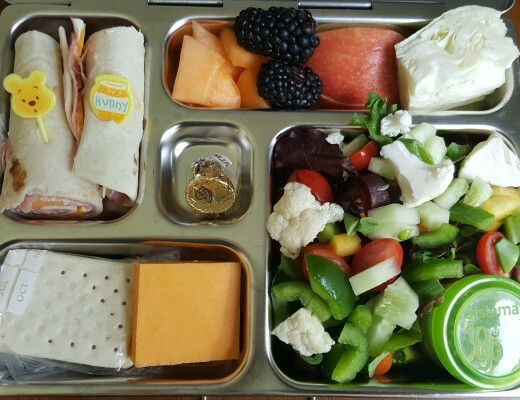 My kids’ lunches are packed in our Planetbox Shuttles. I really like the size of these boxes for my kids and the single latch at the sides makes these boxes easy to open and close. My daughter’s lunch is above. She has Goldfish with a shark pick, a Babybel cheese, and almonds all on the left side. 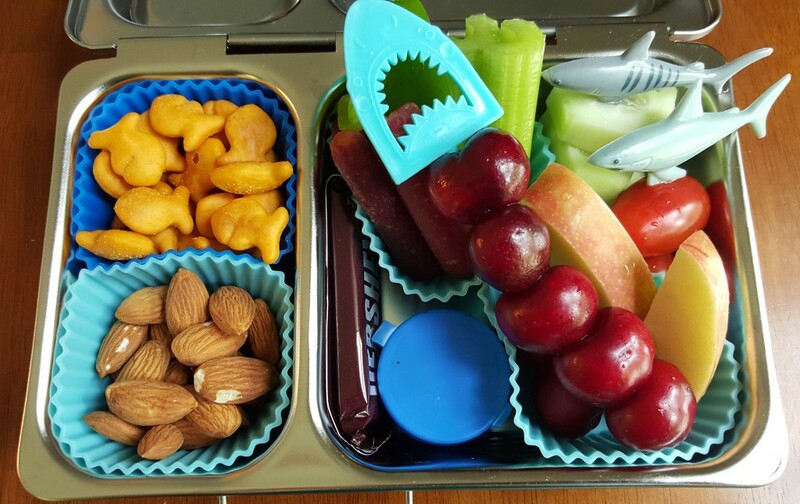 In the main compartment, she has purple carrots, green pepper strips, celery, cherries, apple slices, grapes on a shark skewer, tomatoes on a shark pick, and sunflower seeds in the little blue container. My son’s lunch is similar. He has more almonds and cucumbers instead of cheese. And, I put his cherries on the shark skewer since he really loves cherries. It was easy to get the cherries on the shark skewer because I removed the pits with this handy kitchen gadget. Both kids have a small Hershey bar at the side of the main compartment. I used several blue silicone cups to separate out the foods. 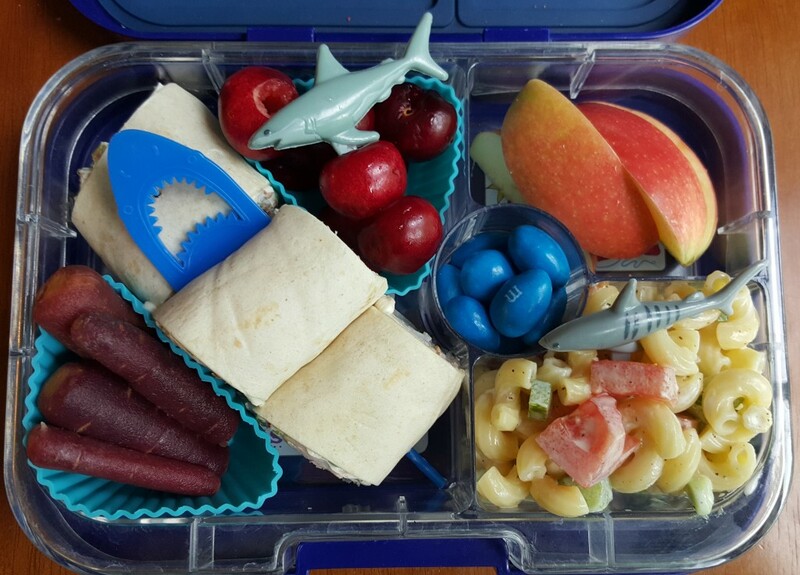 Since I had the shark theme going for the kids, I continued it for my husband’s lunch. 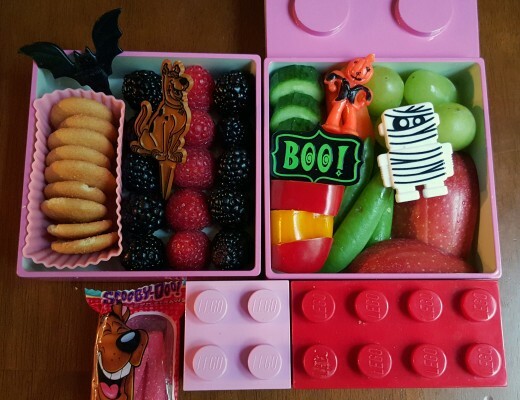 His is packed in our blue Yumbox Panino. He has purple carrots and cherries along side turkey roll ups on a shark skewer. I make the turkey roll-ups similar to this recipe, but I add diced pepperoncinis and cut the recipe in half so I can make just enough for a few lunches. The side compartments hold apple slices and macaroni salad. I included some blue almond M & Ms in the treat section. The Yumbox is great for keeping wet foods like the macaroni salad separate from the other foods; the silicone lid seals off each compartment so nothing mixes. Since my husband likes to add extra pepper to his macaroni salad, I sent some pepper along in this little pepper container from Sistema. 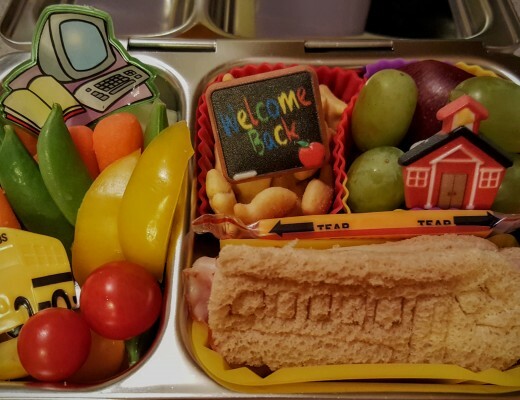 It’s perfect for the job and remembering little details like that really let’s the recipient of the packed lunch know that you care about them. Above are a few of the books we read about sharks. The one in the upper left corner has interesting information about a variety of extant species and a few very cool pop-ups. 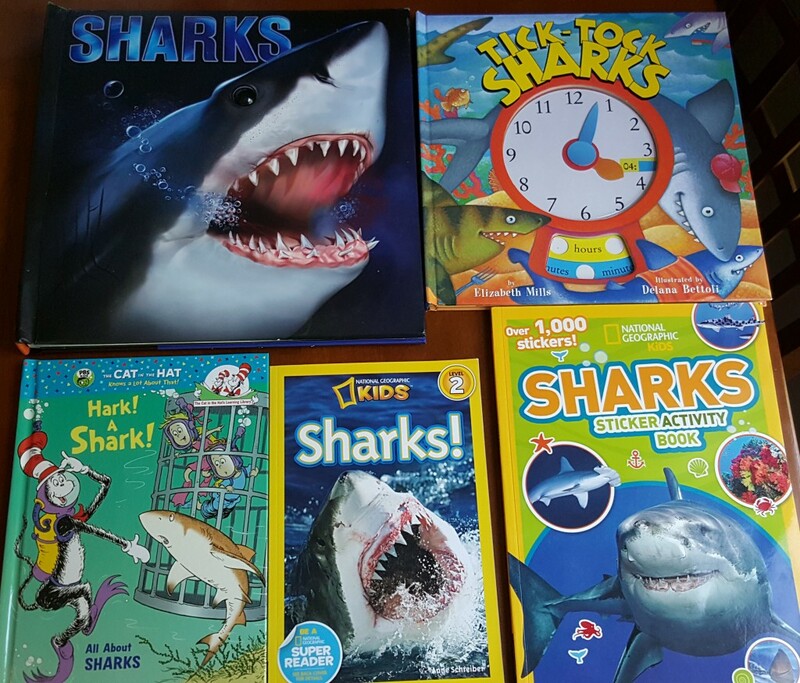 The Tick-Tock Sharks book is one we have had for years. It is a cute story about a variety of sharks and what they are doing at different times of the day. The illustrations are fun and it includes a clock with hands that move so kids can set the clock to the time that matches each part of the story. Hark! A Shark! is from the series of books by The Cat in the Hat Knows a Lot About That! My kids really enjoy those books and we have several of them. Each one is informative and they are written with rhymes that move the book along and keep it interesting. The one titled Sharks! by National Geographic Kids is also part of a series. My daughter read that one aloud to her brother. It reviewed a lot of the same facts from the pop-up book. The Sharks Sticker Activity Book is fun too. It includes many interesting images and tidbits. We like those books for trips in the car or other situations when our kids need to pass some time quietly. After we read these books, my kids recalled a show they used to enjoy: Zig and Sharko. This is a funny show available on Netflix about a hyena and great white shark. The characters do not speak, but they communicate with gestures and nonverbal cues. The animation is clever and my kids enjoyed an episode before bed. Thanks for visiting my blog. Check back soon for more fun lunches.